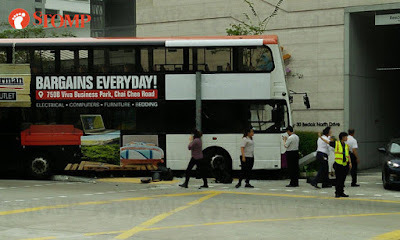 A woman was trapped under a bus after the double-decker crashed into a pedestrian walkway near a traffic light at 30 Bedok North Dr today (Sep 28) at 1.40pm. Stomper Ronald was nearby when he heard a loud bang. He rushed over to see what happened and saw that a bus had mounted a pavement. He saw two women who had been hit by the bus. "I went over to see how I could help," said the Stomper. "One woman appeared to be injured next to the bus and another woman was under the vehicle. "I asked the woman who was on the pavement where she was hurt and she said both of her legs were injured. "I did not dare move her. "The woman under the bus could still talk to us so we tried to keep her awake until the ambulance came." Stomper Mendel heard the same bang and told Stomp that a crowd had gathered around the bus and that ambulances had taken those injured to hospital. Stomper Bobby shared more photos of the crowd at the scene. In response to Stomp media queries, a Singapore Civil Defence Force (SCDF) spokesman said that they were alerted to the incident at 1.32pm. "A woman was trapped under a bus and she was rescued by SCDF using lifting equipment," she said. According to the police, four persons aged between 33 and 55 were conscious when taken to Changi General Hospital (CGH).